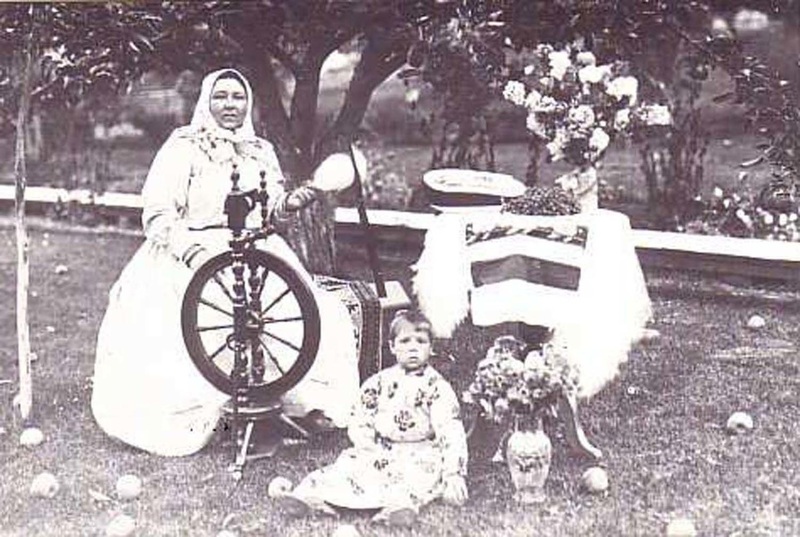 The role of Doukhobor women, since the very beginning, has been one of equality, partnership, emancipation and even leadership. At the beginning of the Doukhobor movement, the realization came to this group that God did not live in churches, icons, priests, candles, rituals or ceremonies. Indeed, God lived in people. No more bowing to priests and icons, let us bow to each other instead, honouring the presence of God in our fellow beings. These fellow beings were female as well as male, so since the inception of their belief system, all were equal and all had equal possession of the "God within". 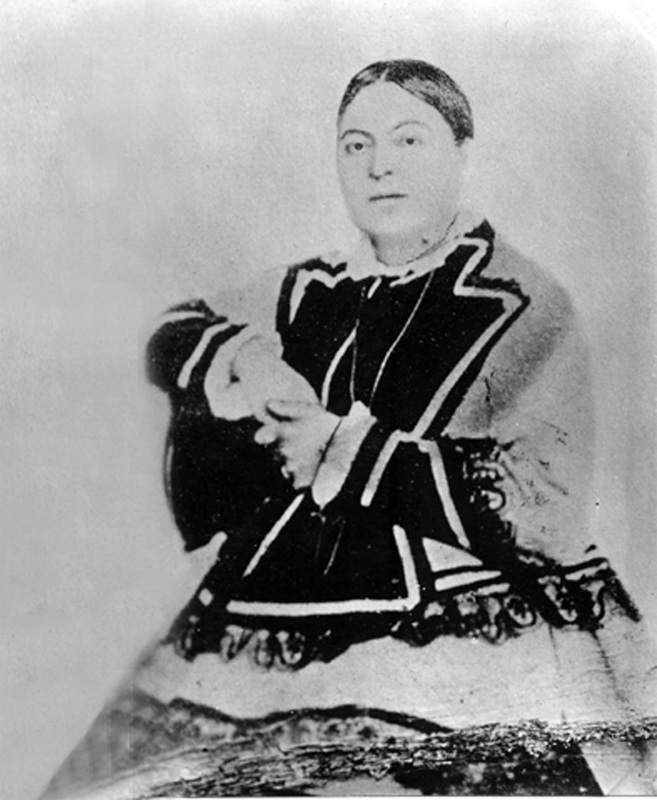 In 1864 the riotous Doukhobor leader Peter Kalmykov died of an illness contracted while hunting. Normally, the role of leader would have gone to his son. However, he and his wife Lukeria, who he had married at the age of twenty [she was sixteen] in 1856, were childless. His deathbed wish was that the new leader would be his wife, "my little cuckoo". 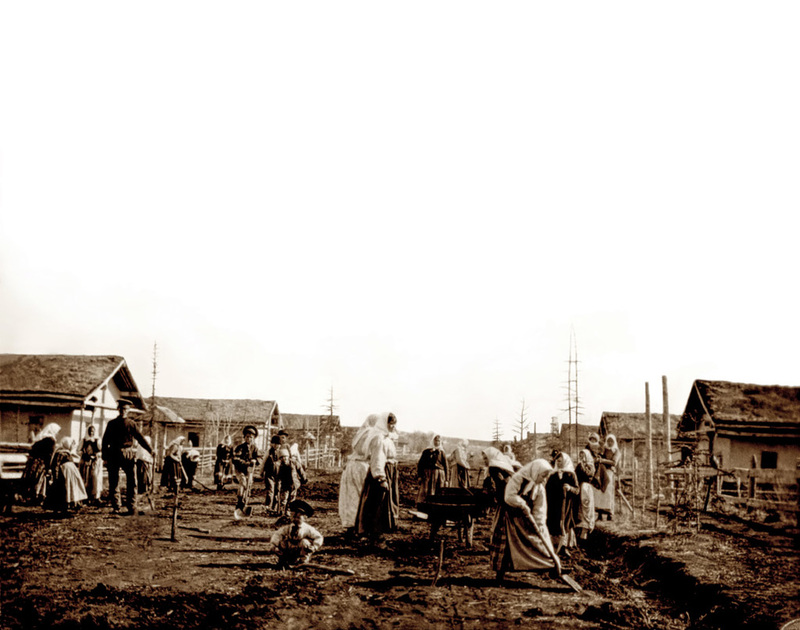 In addition to possessing equal status conferred by the divine presence in all, the communal living Doukhobors provided another advantage in their lifestyle to bolster the equality of women. This was the fact that the husband did not hold any financial sway in the economic life of his wife and children. A wonderful support system was provided by this communal life and a husband could not threaten to leave his wife or children in penury, if for whatever reasons, there were domestic disruptions. If he left, she would still be provided for, and this security cemented a feeling of freedom, independence and at the same time, partnership in connubial life. 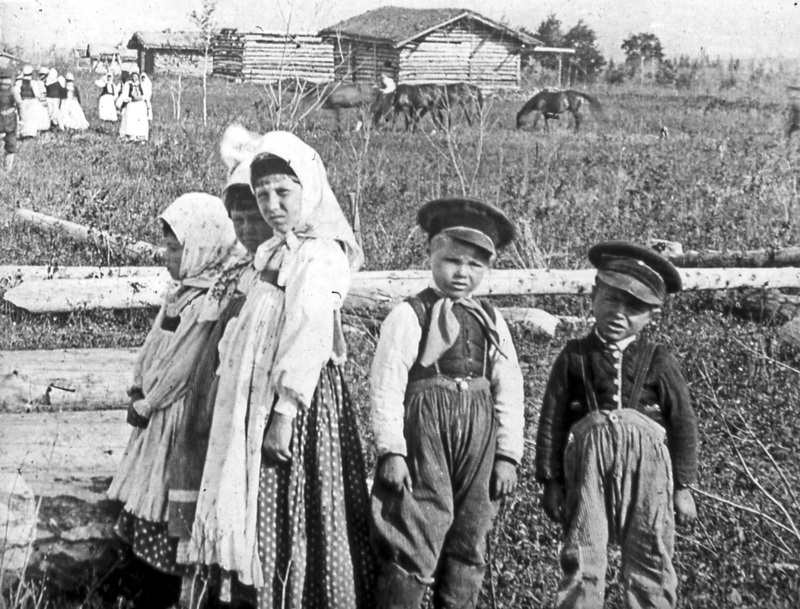 Couples married young and lived long, and there were few separations among the Doukhobors. The harmonious partnership brought about by a tranquil, mutually satisfying relationship was a consummation devoutly to be wished for, in all ways. One of the first pictures that firmly established the Doukhobors in the Canadian psyche was a photograph taken in 1899 which shows a group of women hitched to a plough. 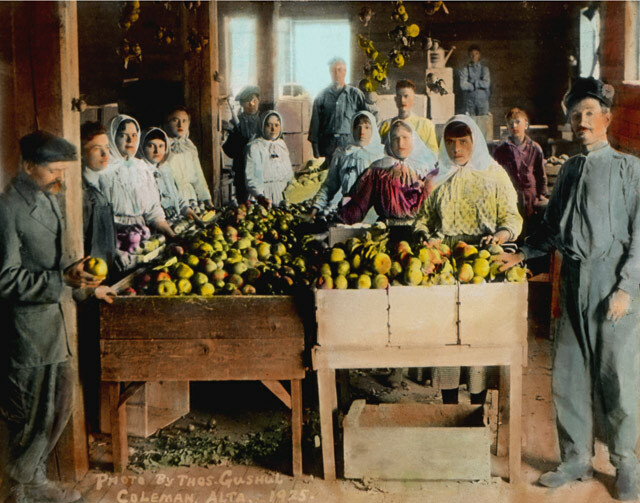 This photograph became notorious and caused inestimable harm to the image of the hard working Doukhobors. With the usual penchant for sensationalism it was presented as an illustration of the Doukhobor women being treated as animals and being exploited by the men folk. The fact of the matter was that the men were building railroad beds and earning much needed money so they could buy supplies and seed for the coming spring. The women, displaying shrewd initiative, partnership and equality, and realizing that they needed to plant much needed gardens for the coming summer, took the initiative and proceeded to break the sod for spring planting. They also supervised and constructed the villages. There certainly was a division of labour according to what roles could be played for the maximum advantage of all, but there was maximum equality in the accomplishment of a harmonious working relationship with the men. In the clearly delineated paths of responsibility, the women also traditionally held the greatest cohesive responsibility for keeping the continuing structure of the community intact. While the Living Book, the oral collection of psalms and hymns which contained the belief structure of the group, was learned and recited by both men and women, it was the matriarchs of the family who passed on this religious and philosophic belief system to the children. In addition to providing security for the wives, the communal system also provided a benevolent shelter for the children, where the "whole village did raise the child ". Children grew up surrounded by "aunts" and "uncles", "grandmothers" and "grandfathers". While the middle generation, their mothers and fathers, went about their pressing duties, the grandparents provided the day-to-day care of the children once they were no longer nursing or in cribs. The grandfathers passed on the physical skills and knowledge of hand crafts, the grandmothers taught them the oral book: "write it on the heart, proclaim it by mouth, for the spirit liveth and the book taketh away." In some cases, such as animal husbandry and gardening, this teaching overlapped as the children served an apprenticeship to grandparents and parents of both sexes. This, of course, provided excellent role models for the new generation. In 1924. when the revered leader Peter V. Verigin was killed in a mysterious train explosion, his life-long companion, Anastasia Golubova, was rejected as leader by the community. She led the Verigin faithful to Alberta and began her own commune that lasted until 1945, another rare accomplishment for the female side. The larger body of the communal Doukhobors went bankrupt in 1938. What of the present-day? How did this feeling of equality fare in the transition of the Doukhobor communal system into present day independent society? As independence and education came to the transitional Doukhobors, the women, for the most part, moved effortlessly into the new lifestyle of the neighbouring Canadian mosaic. However, they also preserved their ingrained characteristic of hospitality and charity, which now focused on the healing professions, and worldwide charity work. 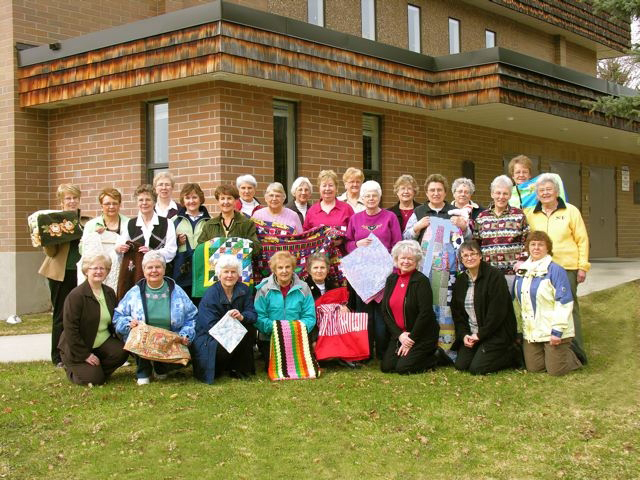 The Union of Spiritual Communities of Christ Cultural Interpretive Society, occasionally partnered with groups and volunteers with similar aims, does much world-wide outreach, with donations to areas in need such as Guatemala, Cuba, Zambia, Kosovo and areas undergoing disaster, such as Badger, Newfoundland. The USCC women are also active in productions promoting an awareness of culture and tradition, particularly aimed at the new generation. Their industrious activity centre in Brilliant also hosts field trips for the community and schools and various special visitors. USCC Cultural Interpretive Society ladies who work at their centre tn Brilliant on various charitable projects.